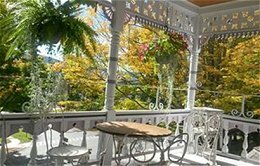 Stay at a historical landmark – the Blackberry Inn, a 1880s Queen Anne style B & B located at 820 West Main Street in Smethport, Pennsylvania. 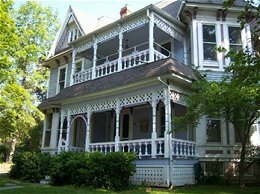 Located on Scenic Route 6 within the Smethport Mansion District, this charming Victorian Inn is only a short distance from the Kinzua Sky Walk, and within walking distance to great fishing at Hamlin Lake, downtown restaurants, and a variety of hiking trails. Upstairs and downstairs open-air porches invite you to relax, set back and enjoy a delicious ice-cold beverage as you admire the scenery. Classic east and west formal parlors, a backyard fire pit, and a gazebo all add to the feeling of times gone by. The beautiful sun-bathed dining room and parlors are all available for your enjoyment. Choose from a selection of historically themed rooms. The William McKinley Room offers a bay window and a chaise lounge. The Woodrow Wilson Room is furnished in Art Deco and Art Nouveau style, and it has a beautiful period brass bed. See a glimpse of cold war and international espionage in the Dwight and Mamie Eisenhower Suite (1953 – 1961), with a secret room behind an invisible door! Live (or re-live!) the peace, love, rock & roll, and flower power of the 60s and 70s in the Richard Nixon Room. It was the Spartan life, the period of the Great Depression, but you will be cozy and relaxed in the 1930s Franklin Roosevelt Room (1933 – 1945) with an en-suite shower bath.